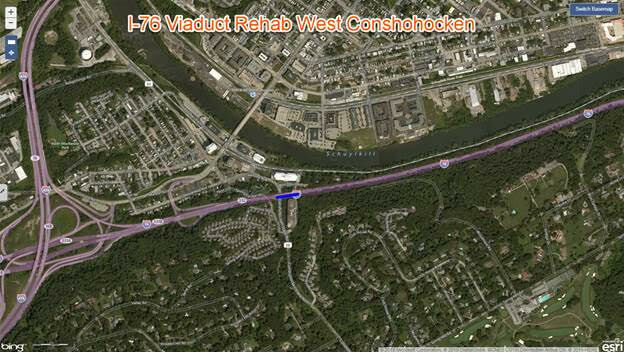 King of Prussia, PA – The Wolf Administration announced today that construction will begin Thursday night, April 4, on a project to rehabilitate two Interstate 76 (Schuylkill Expressway) viaducts, including the 6,120-foot-long structure between Interstate 676 and University Avenue in Center City Philadelphia and a 345-foot-long structure over Route 23 and Arrowmink Creek in West Conshohocken Borough, Montgomery County. The two-year project will require numerous overnight single lane closures and full closures in one direction at a time, as well as a limited number of weekend daytime single lane closures or full overnight closures on either the eastbound or westbound expressway in Center City. Repairs to the structure in West Conshohocken Borough are expected to begin in May or June 2019 and will be completed by November 2019. These repairs will be done using single lane overnight closures seven days a week between 9:00 PM and 5:00 AM. * Maximum allowable weekend daytime single lane closures is 10 times eastbound and 10 times westbound. 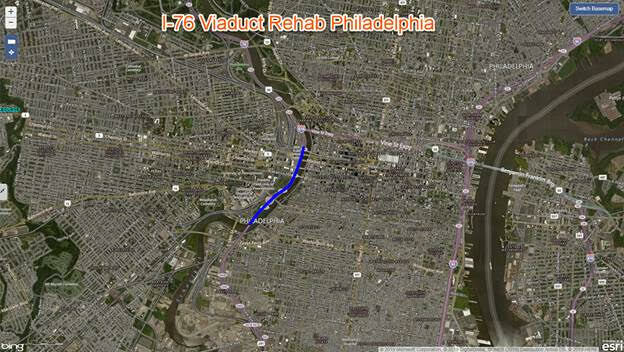 For information about the project, including each week’s planned lane restrictions and/or closings, visit www.I76viaduct.com.